The view incredible! We enjoyed the fireplace on the deck. The cabin is gorgeous and beautifully decorated! It was very clean. The staff was extremely helpful. We added two nights and got our 7th night free! Thank you so much for sharing your beautiful cabin with us! We had an amazing family vacation! We love the view! WE love this cabin, it was very clean and we enjoyed the outdoor fireplace. The Staff is wonderful, efficient, responsive and professional. We enjoyed our stay for the weekend! Cabin was very clean and beautiful. We experienced Polar Express for the first time and loved it. We definitely will be back. The cabin was bigger than it appears on your website. We loved the cabin. We celebrated our Anniversary! The cabin was beautiful and had all the amenities we needed. We loved the view and the big windows! The cabin was beautiful. It exceeded our expectations. The view is perfect. It's our first vacation after all the kids have grown. We have enjoyed the beauty. Everything was perfect! The cabin was very clean, we loved the fireplace, kitchen and hot tub! The cabin is conveniently located to everything we wanted to do! The cabin was very spacious with a beautiful interior and pretty view of the mountains and lake. We loved the high ceilings and windows. The cabin was exceptionally clean and the team at GSCR were a pleasure to work with. Thank you GSCR for renting your beautiful cabin! We chose Morning View to celebrate our anniversary. The architectural features of the cabin are lovely and the moonlight view is as stunning as the morning. Loved everything. We are planning to come back. Cabin was perfect. 5 Stars! Very friendly when answering our questions. The cabin was very clean and the view is amazing! We enjoyed the outdoor spaciousness and the ho tub. We needed this vacation! Thank you so much for allowing us to use your cabin! The view is absolutely breathtaking and is a reminder to slow down and enjoy God's lovely creation. We've already posted pictures and have been asked, "Where is that?" We plan to return. I only spoke with someone shortly after booking (they gave me a call), and they were extremely helpful. All the email correspondence was also super helpful. We had a 'Beary; nice time! 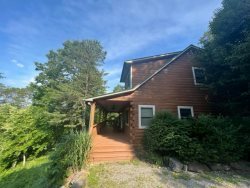 WE truly enjoyed this beautiful cabin and its access to the lake, trails and more. It was our first vacation in a long time and allowed us a beautiful view and quiet time. And a place away from Irma! Melissa was very helpful and easy to deal with! Making memories was the promise of this trip as two families left Wisconsin on Monday. This cabin did just that. We wished we had left more time dedicated to this area on our vacation. Beautiful view and waterfalls in the area. Every night the kids and adults each had to have there turn in the hot tub. Thanks for the stay. Hopefully our futures include coming back here. Thank you so much for the beautiful cabin. None of us wanted to leave. So we extended our stay by a day. So much to do around here, we had a wonderful day on Lake Fontana on a pontoon boat and a drive through the stunning Great Smoky Mountains. All followed by BBQ on the porch with the great views. Nothing more to ask from a holiday. Great Smokys cabin Rental is great to work with. We have used them 4 or 5 times and they are always dependable. We had a fabulous time. The cabin was great and the view was amazing. We enjoyed the area and had a great time celebrating grandma's 60th birthday.